I’ve been writing off and on for years, but never published anything. 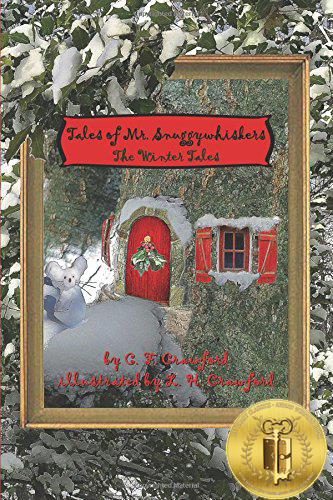 As the Tales of Mr. Snuggywhiskers grew and became more complex through telling the stories to my children and having them tell variations on the stories back to me, it became more important to write them down so Mr. Snuggywhiskers would survive their childhoods. What I wanted to be when I grew up changed day-by-day. It still does! Mr. Snuggywhiskers came to life one day when my eldest daughter was about three years old. I was tucking her into bed and she asked me to tell her a story. She liked to hear stories about herself doing fantastic things like riding dragons or visiting angels on clouds. She was also a big fan of The Lion, the Witch, and the Wardrobe and listened to the opening chapters about Mr. Tumnus over and over. I started to tell her a story about herself, with a vague idea of giving her an adventure that ended with a tea party – kind of like Lucy’s tea with Mr. Tumnus. Mr. Snuggywhiskers just stepped into the story dressed in his blue suit and green vest with a tea tray in his hand. For me the funniest thing about writing the Mr. Snuggywhiskers stories is the sound of the characters talking in my head. I don’t actually write their dialogue. They talk and I just write it down. Sometimes they even make me laugh, which is sort of funny since most of the time I write while riding on a train. There have been several authors that have influenced my writing style in different ways. The most relevant to the Tales of Mr. Snuggywhiskers would be Robert Lawson, author of Ben and Me; C.S. Lewis, author of the Chronicles of Narnia; Edith Nesbit, author of The Enchanted Castle, and Beverly Cleary, author of Beezus and Ramona. WHAT HAS BEEN YOUR GREATEST LITERARY ACCOMPLISHMENT? : Winning the CLC award for Best Chapter Book Series has been my greatest literary accomplishment so far. Hopefully, there will be even greater accomplishments to come! The biggest challenge to publishing the first book was figuring out how to pull all the elements together to turn the story into a book. My daughter did the illustrations, which provided a fascinating insight into how she imagines Mr. Snuggywhiskers to look. After several failed attempts at getting artwork for a cover, I ended up creating the cover myself using an actual tree in my backyard – so it is, in fact, Mr. Snuggywhiskers’s house. My advice would be to keep asking questions and trying different approaches until you find one that works for you. My youngest daughter designed the imprint for Lauco Press. Yes, Tales of Mr. Snuggywhiskers: The Spring Tales, is in draft form, and I’m working on the first draft of Tales of Mr. Snuggywhiskers: The Summer Tales, in which the mystery of Mr. Snuggywhiskers’s father will be resolved. Both books will be available on-line at www.Amazon.com and at www.BarnesandNoble.com.